The first absorption feature in space, a calcium line, was observed in 1904 by Johannes Hartmann. Hartmann realized that light from an observed star was being partially absorbed before it reached Earth. By the 1920s, sodium absorption features had also been observed. In 1922, Mary Lea Heger reported two new stationary diffuse absorption lines in the optical spectrum of several B-type stars. Further systematic studies in the 1930s guided astronomers to the conclusion that species in the interstellar medium (ISM), i.e., the space that exists in between and around stars, may be the source of the observed absorption features. This result was surprising, as densities in the ISM are exceedingly low, much lower than the best vacuums accessible in laboratories. Today the list of identified inter- and circumstellar molecules comprises more than 160 species and is evidence of a rich and exotic chemistry. Following the discovery of diffuse absorption bands by Heger, several more so-called diffuse interstellar bands (DIBs) were identified and in 1975, the first systematic survey of DIBs was made. At the time 39 DIBs had been observed. Today, over 400 DIBs have been identified and amazingly, after nearly 100 years, they all have only one thing in common; no definite carrier has been found for any DIB. See http://dibdata.org/ for a catalogue of publications on DIBs. See also www.iau297.nl. The carriers are generally believed to be molecular and several candidates have been suggested, including polycyclic aromatic hydrocarbon cations, carbon chain radicals, fullerenes and excited hydrogen, but so far without convincing matches. Candidates can only be formed in low abundances, and so sensitive spectroscopic techniques are needed to measure absorption features. Given, the DIBs range from 440 nm to the near-IR, identifying precise and specific features in this range is highly time consuming. Figure 1 shows a schematic of a set-up which is used to test DIB candidates using IBBCEAS. Figure 1: Experiment set-up schematic. PDN is the pulsed discharge nozzle. M1 and M2 are high reflectivity (HR) mirrors, R > 99.995%. N2 is used to flush the cavity mirrors, reducing the effect of any products from the plasma on the HR mirrors. The carrier candidates being tested are carbon chain radicals and are produced in a pulsed discharge of an acetylene/Argon/Helium mixture. In a pulsed discharge nozzle (PDN), a high voltage discharge is placed across a high pressure supersonic pulsed expansion. This is a very successful technique for producing abundances of highly reactive molecular transients, such as those found in the ISM [Motylewski1999]. As the resulting plasma expands through the nozzle it undergoes a high number of collisions, resulting in effective adiabatic cooling, reaching vibronic temperatures between 20 – 30 K. Furthermore, the high number of collisions causes many reactions to take place, resulting in the formation of tens of new species. A white light source, a LOT-QuantumDesign 300 W Xe-Arc lamp, probes the plasma between 4 and 10 mm downstream from the PDN. Light exiting the cavity is incident on an optical shutter, which transmits light only when the plasma exists, ~500 µs. Light transmitted through the shutter is focused onto a circular to rectangular optic fiber bundle, the exit of which is placed on the entrance slit of a Shamrock SR-750-A spectrograph equipped with a 13 µm entrance slit, a 750 mm focal length, and a 1800 grooves/mm grating. The spectrograph disperses light onto a CCD detector Newton DU940P-BV containing 2048 x 512 square pixels of 13.5 µm width. A spectrum covering a 20 nm range can be measured at one time, with a typical spectral resolution of 0.03 nm. The spectrograph/CCD provides sufficient spectral precision and resolution to identify DIBs. Light is collected for ~15 minutes, and a sample measurement between 520 and 534 nm, is shown in Figure 2. A sample observation is shown in Figure 2. The broad increase in light intensity, in Figure 2, is due to a combination of the high reflectivity mirrors of the cavity and the Xe Arc Lamp spectrum. 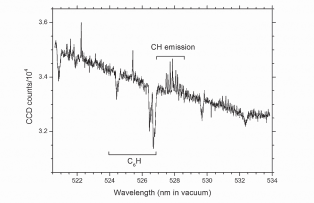 Sharp increases in light intensity above the continuum are due to emission of light from the plasma itself, an example of CH emission is marked. Sharp decreases in light intensity below the continuum are due to absorption of light, from the Xe Arc Lamp, by the plasma, an example of C6H absorption is marked. Figure 2 demonstrates that emission and absorption features of the plasma can be measured over a broad region in one observation. The observed features can then be compared to astronomical observations of DIBs, in the hope of finding carriers. The described technique can also be easily applied in the study of other potential candidate, such as excited hydrogen or PAH cations. The search for the carriers of the DIBs is the oldest unsolved mystery in astronomy and solving the puzzle would result in a huge development in the understanding of the chemistry of the universe, as well as providing a new diagnostic resource for examining the interstellar medium. This set-up’s ability to swiftly test candidates, will hopefully bring us a step closer to the carriers. [Berden2009] Cavity Ring-down Spectroscopy – Techniques and Applications; Berden, G., Engeln, R., Eds. ; Wiley-Blackwell: Chichester, United Kingdom, 2009. [Motylewski1999] Motylewski, T.; Linnartz, H. Rev. Sci. Instrum. 1999, 70, 1305-1312. [Fiedler2003] Fiedler, S. E.; Hese, A.; Ruth,A. A. Chem. Phys. Lett. 2003, 371, 284-294.